Saturday morning we woke up pretty early and Fredrik joked, "we could go to Norway today." But he sort of looked at me in that way that you know your significant other is actually saying "let's go to Norway today." So I looked back and thought...is he serious? I said, "do you want to?" So we agreed and got busy showering, making coffee and planning to get money exchanged and grab my passport. What a great decision! We went to a border town of Halden and saw a huge fort from the...eh...1600s? The museum wasn't open, on a Saturday...guh...really, this town was pretty dead. But it was a blast to walk around and read the funny signs and hear the funny Norweigian people talk. I loved the spontaneity of the trip. Fredrik is such a wonderful man to do something like that for me. He knew I was itching for an adventure with him. We started our tradition, as my mom and Marshall do, buying a key chain every place they visit together. I love this, it's a great way to remember. We couldn't find a sourvenir shop! Ugh! But we found a place that sold some keychains and bought a big letter "N"...for Norway. It took us about 2 and a half hours to drive there, and the same back. Fredrik found I'm not so great to road trip with, especially around 11-1 because I have to pee, A LOT due to large coffee consumption. oops. I cannot wait to share many more spectacular views with this man. He really is the man of my dreams and I'm so lucky to experience the world with him. As you can see we are kind of far up! :) Such a beautiful time to be up there...I love the pink sky and the mountains! And here is your normal thing for the day. Some money, with a special edition...Norweigian money too! The top is "our" money which is "Kronor" and the Norwegian language is so close to Sweden they call it "Kroner". And if you are me and speak English you just call is a crown. Like 100 crowns. Haha, the easy way out! And I have no idea who the woman on the Norwegian money is, with some research I could find out, but I don't care so much. The guy on the Swedish money is Carl von Linne who was a Swedish botanist. The back image is a bee polinating a flower. Sooo cool! Their money is so much more colorful and I love the sparkly stuff on the edge! Random note, Norwegian coins have holes in the middle! A lot of thinking has been going on in my head. Jayden, who is my niece Emma's 4 year old cousin, has cancer...again. 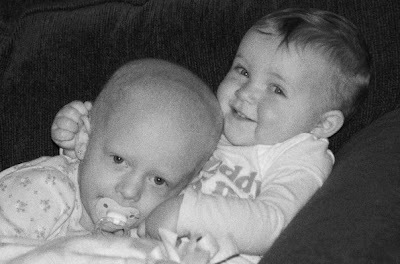 She is undergonig more chemo than any person should ever have to endure, and especially any 4 year old should have to endure. I am sending as many positive thoughts their way as I can. And for anybody reading this, I'm sure you already know about her, but send one her way, also. "knäckebröd" which is very hard crisp bread. But honestly, I don't think they need to write the difference on the package, it's really obvious the difference, but...fairness is the name of the Swedish game. And, Swedish bread is a lot tasty than the bread we have. I'm going to miss it! The Swedish word of the day is "bröd" which means "bread" and is pronounced "bruhd". Also, I'm gonna make sure to answer questions. Since I have like...4 loyal readers, I better treat them good! So starting with the last post, mom asked me when it will stop snowing here. Everybody keeps telling me..May. I don't know if they are just scaring me, or if they are serious. I have also heard that is when the snow will for sure be melted away. Ugh. Sofia, we don't have a date here. Nor do we have plans. It's merely for legal purposes! :) Sorry! The Swedish word of the day is "flaska" which means "bottle". Here's your normal thing of the day. This is...duh...milk. It's pretty similar to the US, color distinction between the different percentages of milk. Here in Sweden though, they are incredibly lactose free friendly, which for me, is awesome. They have everything from milk to sour cream, whipping cream to cream cheese. I love it! The other thing with this milk is the date it expires, along with other products such as cheese and bread. Here, they use fresh products and A LOT less preservatives, which is so healthy, but things go back really fast! So the day this expires, throw it out! Once I bought Fredriks favorite bread and we didn't finish it all and I didn't think twice about just leaving it in the cupboard. But when we returned after the weekend, the 2 pieces left were COMPLETELY green. Fredrik was absolutely horrified I let that happen! It is pretty disgusting, but how many of us Americans leave a loaf of bread in the pantry for weeks and can still eat a slice? The Swedish word of the day is "mjölk" which is "milk" and is pronounced "myuhlk". More food, good friends, some games, a lot of fireworks, lots of booze and a great New Year's kiss! Here's to 2010! Last night Fredrik and I headed out for an hour and a half long walk to this bridge. Fredrik lives on a big hill in Sweden that looks over all of Gothenburg, so last night our short walk ended up being a walk to this bridge. We walked half way across so we could see the amazing view. It was really exciting to walk across such a huge bridge! I'd never done that before. I think we are going to make it our goal to walk to as many such places as we can. Good exercise and new experiences! That's what the New Year is about, right? :) Wonder where we will go today? 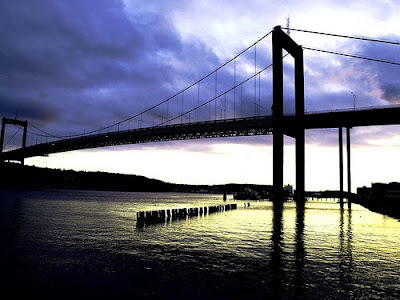 The Swedish word of the day is "bro" which is "bridge". No, it's not short for brother. :) This bridge is called the Älvsborgsbron.